Cornerstone Printing is an independent full service print shop located at SFU Campus, Burnaby, BC. At our copy & print centre, we provide total solutions to all of your design, copy and printing projects from start to finish and are dedicated to providing you with the minimum turn around time at low prices and high quality. We are open 6 days a week and accept orders on disk, in person or online; just email us your file and we can have your final product ready in a fraction of time. (please note we need credit card info. for online orders; you may provide your Visa/ MC number with exp. date, CVV # through email or phone). Our friendly and experienced staff are committed to guarantee 100% customer satisfaction. We pride ourselves on service, quality, price and delivering jobs right and on time. For your convenience, both self and full services are available.You don't need to buy any printing or copy cards; however it's a wise choice to buy our credit cards and get discount if you are a regular customer and don't carry cash. Don't hesitate to contact us if you have any special orders or need more information on flyers, posters, cards, ... Let us show what we can do for you. We believe we can be your only source for all your printing requirements. 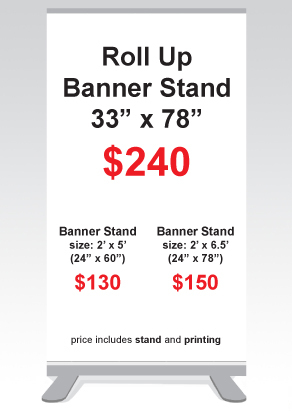 Large Format Poster Printing on Fabric (Canvas) Available Now! the more printing, the more saving! We have great saving for larger quantities; there is price break down on +50, +100, +500, +1000. The more printing, the more saving. please check our price list for more details. We charge min. two dollars; as an example any b&w printing less than 18 will be charged two dollars. SFU students are recommended to do their very small quantities of printing/photocopy requirements at SFU library or other in-house printing services and consider our print shop for higher volumes.